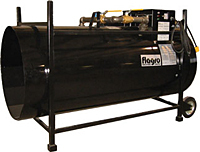 Need a Dual Fuel Construction Heater Rental – Rock Salt & Ice Control HQ Offers the F-1500T by Flagro. The F-1500T provides your professional crew with powerful heat for a variety of construction and/or during maintenance projects. Rock Salt & Ice Control HQ (a Duke Company) offers value pricing, fast delivery, accurate price quotes & highly rated customer service not only on deicers but is an Upstate New York heater rental leader as well. Fuel: Propane or Natural Gas. Change fuel supply with the turn of a valve, just turn the fuel selector valve. Call Rock Salt & Ice Control HQ (a Duke Company) at 585-292-9870 (Rochester NY) and 607-347-4455 (Ithaca NY) for more information, business hours and all your snow and ice removal needs and information. In Need of a Ground Heater Rental?